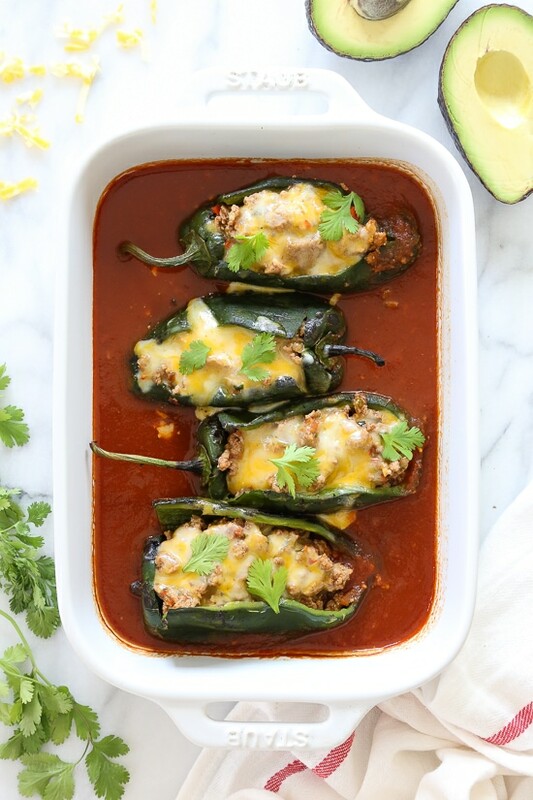 These baked Turkey Enchilada Stuffed Poblanos Rellenos are peppers stuffed with a flavorful ground turkey filling, topped with my homemade enchilada sauce and cheese. These are so much lighter than restaurant chile rellenos which are typically battered in egg and deep fried. You may also like Chicken Enchilada Zucchini Roll Ups, Spaghetti Squash Enchilada Bowls and Enchilada Soup. Poblano peppers have thicker skins than bell peppers, so they are roasted first to remove the skin, much like you would do with roasted bell peppers. 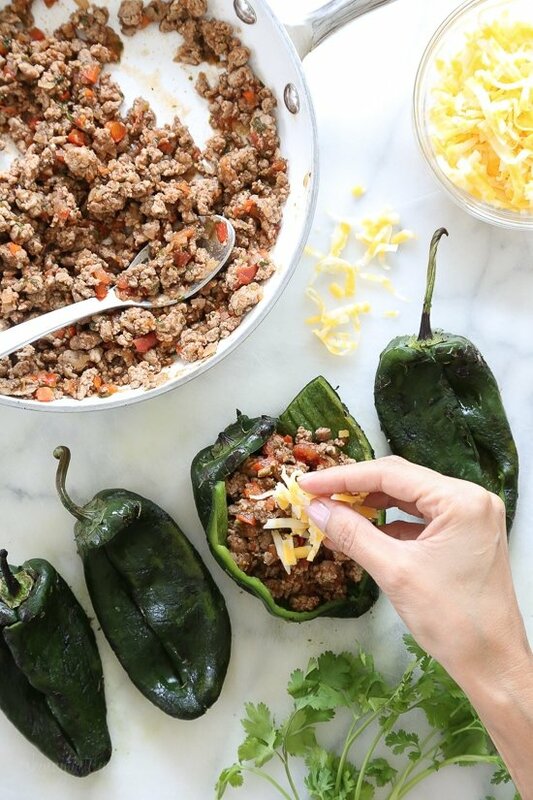 This lends to the smokey flavor of these stuffed peppers, which are mildly spicy, cheesy and delicious! You can use canned enchilada sauce, but I highly recommend my easy homemade enchilada sauce recipe instead – you’ll thank me later! Serve them with rice and re-fried beans, a few slices of avocado or to keep it low-carb they would be great with cauliflower rice. You can easily double or triple the recipe, and leftovers freeze and reheat well. Enjoy! Lay the poblano peppers on a work surface so they sit flat naturally without rolling. Using a small, sharp knife, cut a lengthwise slit along one side of each of the poblano peppers, then make a small cross-wise slit along the top to create a T-shaped slit, careful not to cut the stem off. Carefully cut out and remove the core, then scoop out the seeds. Using tongs, roast the poblano chiles over an open flame such as the grill, broiler or stovetop, turning often until the skin is completely blistered. Transfer to a plastic bag (or place in a bowl and cover with plastic wrap) and let steam for 10 to 15 minutes to loosen the skins. Once they are cool enough to handle, use a butter knife to scrape away the charred skins and discard, careful not to tear the peppers. Set the roasted poblanos aside. Pour 1-1/4 cups of the sauce into the bottom of a 9 x 12-inch casserole dish. Meanwhile, brown the ground turkey on medium heat in large sauté pan and season with salt and pepper. Use a wooden spoon to break the meat up into small pieces. Add the chopped onions, garlic, pepper, tomato and cilantro and continue cooking on a low heat. Add cumin, oregano, bay leaves, and more salt if needed. 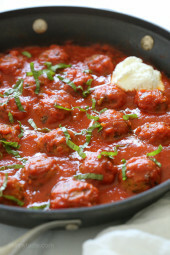 Add tomato sauce and 1/4 cup of water and mix well, reduce heat to low and simmer covered about 15 minutes. Carefully stuff about 1/2 cup of the turkey mixture into each poblano pepper. Place the peppers seam side up over the sauce in the baking dish and top each with 2 tbsp of cheese. Cover the dish tightly with foil and bake in the oven until hot and bubbly, about 30 minutes. Serve hot topped with cilantro or scallions on top. I was going to be lazy and buy a can of enchilada sauce instead of making my own, I am so glad that I didn’t the enchilada sauce was so good. The whole dish was amazing I will definitely be making it again. I loved this recipe. I think I’ve made it twice now. I made the homemade enchiladas sauce and froze it a while back. It defrosted beautifully and worked well in the dish last night. I’m a big spice fan so I upped the cumin and oregano a bit but otherwise it was perfect. I paired it with a Birdseye Southwest Blend and topped it with some fat free Greek yogurt to chill out the sauce a bit. So good. One of our favorite dinners. Made this today using leftover picadillo (your recipe). It was delish! Your enchilada sauce is a fantastic. Will make again! Has anyone tried these with beef? Not a fan of turkey. Yes, I made using Gina’s picadillo recipe and it was great! Spot on great recipe, thank you for sharing. Made this yesterday for me and my husband and he loved it! It turned out great. I put leftover sauce in a mason jar and did a quick canning with a pot of hot water. Now I have the sauce ready for another meal! Never had thought of making poblano rellenos without having to fry them. Love this low fat idea! Thanks! Made this last night for dinner and it was SO delicious. I just want to give some advice if you’re cooking this on a weeknight. Make the sauce and roast the peppers ahead of time. Otherwise it is so time consuming. By the time I made this after work and ate last night it was 8:30. I made the mistake of roasting the first two peppers one at a time with tongs over an open flame on my stove, but for the second two I just laid them both right on the grate of my stove and let them blister. It was much less time consuming and I think they came out better. I will definitely make this again, but I will make everything the night before and bake them when I get home or save it for a weekend. Love this recipe! It was delicious with cilantro lime cauli rice and refried beans (I’m a wimp and these helped cool the little bit of heat). My one gripe is that this is definitely not a weeknight meal. If you do make this during the week I would make the sauce and roast the peppers ahead of time. Also I made the mistake of holding each pepper over the flame of my stove for the first two. For the second two I just put them both on the burner and turned them once in a while- it was much faster this way. I would definitely make this again on a day off of work. Can i make all this in a pressure cooker insta pot? I made these with pasilla peppers. Somehow i did not see there was enchilada sauce and made them without. My hubby still went back for seconds! A little too time intensive for me though. Made these tonight with extra spice in the enchilada sauce and in the filling, and we LOVED them. My Canadian husband was in heaven! 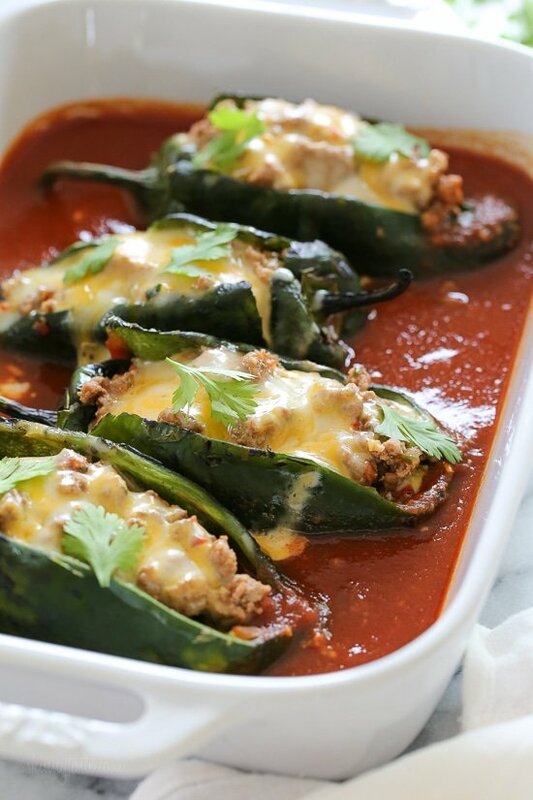 I’m a fan of chile rellenos, but these are delicious without all the breading. 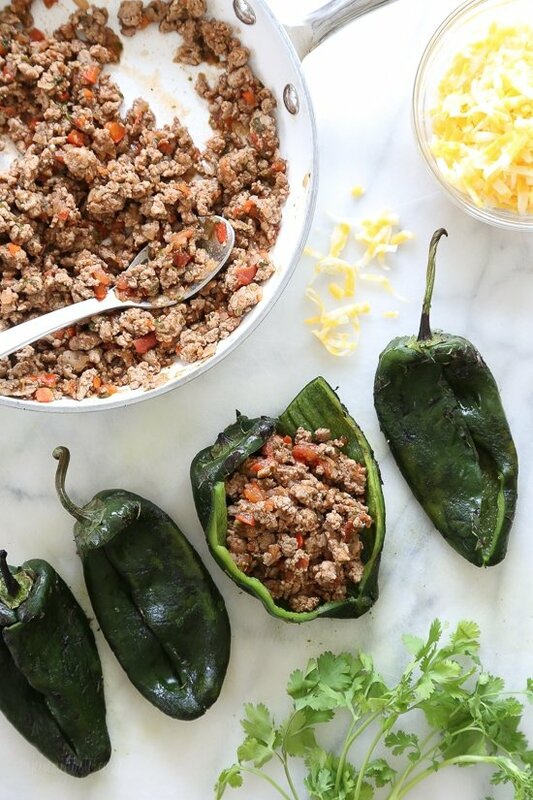 Thanks, Gina, for posting an adaption for one of my favorite Tex-Mex dishes! I’m a Texan transplanted into Canada, so I really miss my Tex-Mex! We do have a wonderful import store here that has fresh ground chile powder and cumin, so it really steps things up. Can’t wait to try this! We really enjoyed these! A good kick with the spice, but my 8 year old still ate them. Although, my store only had regular chili powder… no mexican, so that might spice it up more. I had mine over cauliflower rice and they had brown rice. I will admit it was pretty labor intensive and made many dirty dishes, but it was worth it. I’ll certainly be using that again too! Thanks for the recipe! Hi 🙂 Quick question… it seems like the only ingredient is the colby jack. When I put that in the recipe builder, it comes to only 2 points for 1 poblano. Where are the 4 other points coming from? Thanks for your help!!! Love you and your recipes. This recipe is amazing! I love Chile Relleños but stopped makibg them because of the calories in the frying process. Thank you Gina for giving me an alternative! My hubby liked them too. I shared your recipe with my mom and uncle. Can I make this with out roasting the poblano pepper? Is there a reason for roasting it? I do have a way and I just want to make sure that it wont ruin the recipe. I made this last night to rave reviews from everyone. Delicious! A keeper, for sure. Thank you for the amazing recipes and meal plans. You’re changing my life!!! Here’s a tip for working with any type of spicy pepper (poblanos, jalapeno, etc): Go to the drugstore and buy a box of finger cots. These are individual finger protectors (I don’t know whether they are latex or not, so check if you have a latex allergy). Simply roll the cot down over your fingers; they fit tighter than a full hand glove, and when done, just roll them back up and discard. This was amazing! Well worth the extra prep time. If you don’t have an open flame, I’d suggest putting the peppers on a sheet pan and turning the oven to a high broil. This did a nice job for me. Made these tonight and they are amazing. Store was out of poblanos so I got chilaca peppers, used reduced fat Mexican blend and each serving is only 1 point. Definitely a keeper. Do you have a recommendation for a low carb side dish to this? These were so good. They are on our dinner rotation. One of my hubbies favorites!! Made these last night and they were awesome! The homemade enchilada sauce was so delicious and easy to make.. I did use chopped up rotisserie chicken in place of the ground turkey as that was what I had on hand and it was incredible. These were delicious! The enchilada sauce made them! I am going to use the sauce all the time now- my husband and I loved it! Thanks for the recipe. Hi Gina, I have about 50 cookbooks,, but yours are my favorite! Our favorites are: Zucchini Lasagne*; Baked Penne and Eggplant; Chicken Marsala; Chicken Parmigiana;and your Frittata., I can’t wait to try your Turkey Enchilada Poblanos. I am also thrilled to hear you will have a new book! Thank you so much for your recipes!! *my husband loves it and he doesn’t even like zucchini!! Hi. Do these freezecand reheat well? A friend just had twins prematurely. I wanted to make some dishes that she and her husband can have in the freezer and just heat up after a long day of being in the NICU. Any advice would be appreciated. No one else must have done this but I touched my face, nose mouth after handling the poblano chiles and got burned. I used yogurt to neutralize the chemical reaction and it worked. Just must have been me. 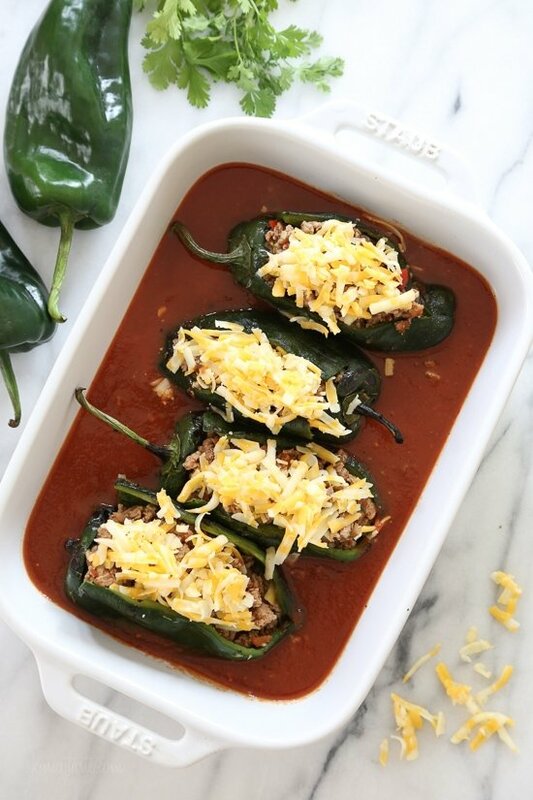 This is hands-down our favorite chili relleno recipe! The homemade enchilada sauce is a must – it makes the entire dish! Amazing! A little time consuming since I also made your homemade enchilada sauce but soooo worth it! Just wondering…does anybody else find it easier to peel the peppers without steaming them? I find that once I steam them, the skins don’t like to peel off. I’m so super guilty of not reading a recipe, just getting all the ingredients. So when I realized I had to make the enchilada sauce, roast the peppers, peel them….etc, well….we ate late but WHO CARES! This recipe is SOOOOOOO good! Totally worth all the effort! VERY GOOD like I can’t say enough amazing stuff about how perfect everything is!!! Will definitely make (and plan next time) again!!! These look quite yummy. I plan on making 2 with turkey and 2 with tofu. Gina, do these need to be thawed in the fridge then reheated in the oven, or can they be reheated straight out of the freezer? At what temperature and for how long? I apologize if this has already been asked and answered! This is my question too. Any advice? Tried this recipe today and it was delicious. Roasted my peppers on the grill, added some red pepper flakes to get a little more spice. Husband approved. Great recipe! I put on my big boy cooking apron and made these today. I can’t wait to eat one tonight and for lunch the next three days. Today was another “all Gina” meal day — breakfast egg cupcakes, zucchini turkey burger, and the stuffed peppers. The enchilada sauce is out of this world! I’ll be poaching eggs in it one day this week. How can I use up the extra chiles in adobe? I grind the rest to make a chipotle paste and then freeze them in 1 tablespoon dollops on a cookie sheet with parchment paper then transfer to a container once frozen for future recipes. I made this last night and it was amazing. I loved the homemade enchilada sauce also. I served it over brown rice and it tasted like something from a restaurant! I was a little confused as to how much of the pepper skin needed to come off, as some of my peppers were more blistered than others, but it worked out perfectly even with some having a little skin. This also took me quite a while to make, so in the future I will probably try to prepare the sauce ahead of time. Can’t wait to make it again! Do not substitute pasilla peppers for poblano because all of the grocery stores in your area have let you down and they “might turn out okay”. They are about as hot as a jalapeño and not ideal for eating large amounts. Just in case anyone else is as stupid as I am. ???? My store listed sold pasillas as poblanos! Glad I tried the pepper before I cooked with it! SOOOO hot! These were a complete success at my house! The homemade enchilada sauce is absolutely amazing as well! My husband and I loved them fresh and for leftovers at work! Thank you! I made the peppers and loved them. However, I love stuffed green peppers. The taste much the same. These were fantastic. My husband loved them. Thank you. Hi Gina, this recipe looks amazing. I had a small question for you. Is it possible to blister the peppers in some other way (other than open flame or grill). I live in an apartment with an electric stove and without a grill. Thanks so much!! Lana, just ran across your question. I also have an electric stove, so I set my oven to broil & put my pepper, tomatoes, etc. On a jelly roll pan. Times dependent on what you’re broiling. I eyeball it, & so far so good. Hope this helps. Thank you, Esther! I have had this same question for a while and have not made certain recipes because I don’t have a source of open flame. You are broadening my horizons! I made these tonight and they were so good!! I also made the homemade enchilada sauce. Yummy! Thank you for sharing! Can you make these using green peppers instead of the •4 large fresh poblano chiles? This is an amazing recipe! One thing I found that makes it easier is to add some of the enchilada sauce into the ground beef mixture instead of adding tomato sauce, cumin, and a lot of the same spices. And I like to make a double batch of the enchilada sauce and freeze it in small containers so I can get home and make this recipe in a hurry. It’s a really fast supper if you have the sauce ready to go. I made these tonight and holy moly guacamole! 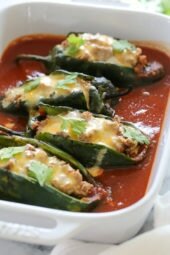 We love Latin dishes, especially chile rellenos and enchiladas, so this was a perfect way to enjoy them without loads of calories. I especially loved the homemade sauce, and I can’t wait to freeze it and try with your Enchilada Chicken roll-ups. I served mine with some fat free refried beans and a guacamole salad, and it was better than a restaurant. 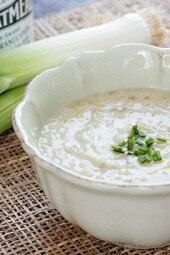 Your recipes have really helped me on my Weight Watchers journey, and I’m so grateful! My store didn’t have the Poblano peppers so I used Anaheim instead but it still turned out amazing! Made these tonight for dinner and they were beyond fabulous! I had a very happy hubby when he walked in the door from a 12 hour work day. Thank you, as always! Rick Bayless’s restaurants. They were amazing and yes the enchilada sauce is the best we’ve ever had! This recipe is a keeper. Thank you for all your wonderful recipes. Made these last week, so good! I accidentally dumped a little extra chili powder in my sauce, but it was good…just had an extra kick! Paired it with the cauliflower rice for a delicious low carb meal. These were absolutely amazing! I’m putting them on our menu again next week! What would you serve with this to make a meal? I made these last night and they were delicious! Thank you!! So good! Made these tonight. They took a while but they were worth it and my 10 and 6 year olds loved them too! Love to hear it Lauren! 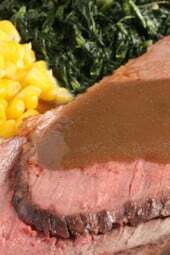 My husband and I are gluten free and doing low carb–we had this tonight and it was absolutely AMAZING!!! I’ve been making stuffed peppers for years, but with rice. The poblano peppers and rice free are just beyond fabulous! Tried it!!! Soooo good. Doubled the recipe, and made in a shallow slow cooker instead of the oven (high for 2 hours). I think I’ll try with shredded chicken next time ????. First time cooking with poblanos also. Sooooo annoying – had you use burners on my range since my broiler doesn’t work right now. I managed to get the desired roasting of each pepper, but it was time consuming. Definitely a must try recipe! This is one of the best recipes I have made. I use your site for almost everything I make and love it! Thank you! It is working here now and I can’t wait to try this one. Your recipes are always super good!!! I made these tonight and they were AMAZING ( I substituted the turkey for shredded chicken). I must have roasted my peppers to much though because they were basically floppy and flat after I took the skin off. However, I improvised and used whole wheat wraps and filled each with a (floppy) pepper and the filling. Same flavor, different presentation. Im making these again asap. My peppers were so soggy after I broiled them, so I am opting not to bake them further. Let’s see how they turn out! I typically “roast” my chiles on the burner. I have a gas stove and place them directly on the burner, turning them as the skin blackens and then put them in plastic bag allowing the heat and steam to make them easy to peal. Question about the amount of cheese. The recipe calls for 1/2 cup of cheese total, but each serving is supposed to get 1/4 cup (per directions). So, do we actually need 1 cup of cheese? Thanks for continuing to make such yummy, healthy recipes! I made these last night and they were wonderful. A lot of sauce for four relents but will save sauce for chicken enchiladas. Hate spell-check. Rellenos not relents. Hi Gina, I’m making this tonight! So excited! However, the recipe calls for 1/2 c of shredded cheese, but the states to top each of the 4 peppers with 1/4 c of cheese…….which is correct? 1/2 cup total is correct. have been waiting for this recipe to post! I love poblanos! I make them with shredded chicken and mix with sliced green onion, cilantro and lime juice and a little bit of shredded monterey jack cheese. These look fantastic, will be making this week! Thank you! Almost done making these! They look and sound amazing. At the end of the recipe it doesn’t say when to add the enchilada sauce…or could be me completely missing trying to do it on a phone. Do you cook them in it or add at the end? Step 7: Pour 1-1/4 cups of the sauce into the bottom of a 9 x 12-inch casserole dish. This recipe looks absolutely fabulous! My three-year-old son is a huge fan of anything ground turkey + cheese. I can see him eating this by the double fistful 🙂 Can’t wait to try! I am a mexican and i love cummin, so chill out Otilia! She is trying to make it healthy! To be fair, she never claimed this was an authentic Mexican dish.. Authentic or not, it sounds delicious to me. Wow, Otilia Incontro, there’s no reason to be rude. If you don’t like the way a recipe looks, just don’t make it – no snide comments are necessary. Gina, I think this looks awesome, and I can’t wait to try it!! Otilia, I am Mexican and grew up with my great Aunts, aunts and my own mother adding cumin to mostly all the dishes. It is very much Mexican! Maybe not in your town/ranch/city but it certainly is in ours. I’m also Mexican and we use it all the time. Maybe it’s just your family. Either way, if you dislike it, then leave it out and keep your pointless comment to yourself. Otitis, I’m Mexican, & we use cumin all the time. Maybe they don’t use it much in your particular region? My families come from Sonora & Michoacan, & cumin is always available in everyone’s kitchens. I’m a Texas living now in Canada, and I miss my Tex-Mex chili rellenos so much. Thanks to Gina, she made these Tex-Mex, and not “real Mexican”. Can’t wait to try them. It’s a shame you couldn’t have tweaked the spices to your liking and left well enough alone. Perhaps you use comino in your recipes? That’s cumin, you know. Did you mean 2 oz of tomato sauce? Combined with the 1/4 cup water for the sauce will equal 1 1/4 cups sauce? I want to make this yummy recipe is why I ask. Thanks for your fabulous recipes! I have your cookbook and am a big fan! It’s 2 ounces (or 1/4 cup) of tomato sauce plus 1/4 of water. The 2 ounces of tomato sauce and 1/4 cup of water goes into the turkey mixture which you can see when you read the recipe. The enchilada sauce is a separate recipe ! Step 3 for the peppers includes a reference to a jalapeño pepper, but it is not mentioned anywhere else. Did you mean it to be included with the turkey after roasting? These look wonderful! I will switch out the turkey for ground chicken, not a big fan of ground turkey. I love poblano peppers and use them frequently in cooking. Love your website, this looks amazing, do you cook and cool the peppers before freezing? It would work either way! These are amazing and I love your enchilada sauce too. I am going to make another batch of them, but I just want to verify they will taste good if I freeze them. If yes, should I just thaw them out and then cook them. Thank you so much for all of your amazing recipes! You’re welcome Julie! Thank you!